S&T is now providing a migration path for organisations who are no longer able to obtain support for their Softel MediaSphere™ DSM-CC object and data carousel systems for DVB and US Cable operations. TSBroadcaster provides enhanced functionality in a proven product package that is actively maintained and supported worldwide. S&T’s engineering team is committed to the continued development and extension of TSBroadcaster to meet evolving requirements and standards, and is actively working on strategies to assist organisations with migration. For broadcasters and operators who need reliable and supported carousel delivery this is an excellent opportunity to switch to S&T’s world-leading TSBroadcaster™. 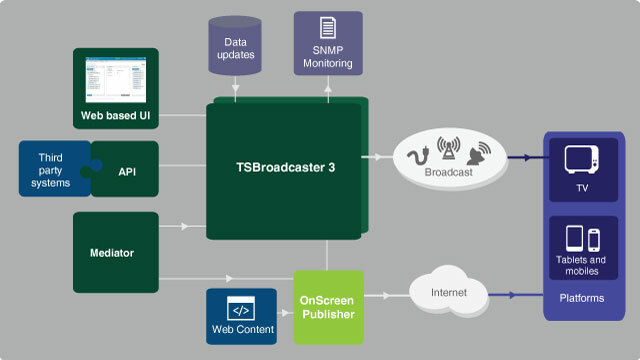 TSBroadcaster is the market-leading advanced delivery system for interactive applications for digital television, providing continuous application insertion and play-out, data updates, signaling and stream event generation. TSBroadcaster’s reliable, scalable technology provides DSM-CC object/data carousel and streamer solutions that can be integrated with your existing systems via a comprehensive API. It is designed to be fully compliant with worldwide television specifications, and the core functionality of TSBroadcaster includes support for HbbTV, MHEG, OCAP, EBIF/ETV, MHP, DVB SSU, Common Download and DVB AIT.